Device Asus Eee Keyboard will go on sale in April, 2010. As informs SlashGear, it was declared on March, 3rd by the president of company Asus Jonney Shih at IT exhibition CeBIT 2010. Eee Keyboard represents the small desktop computer used for a narrow circle of problems. By means of the given device it is possible to work on the Internet and with Internet appendices, to reproduce music and video, and also to edit documents. Asus has presented a device prototype at exhibition CES in January, 2009. In March, 2009 Asus has shown modifed variant Eee Keyboard, having promised, that it will go on sale in the summer. 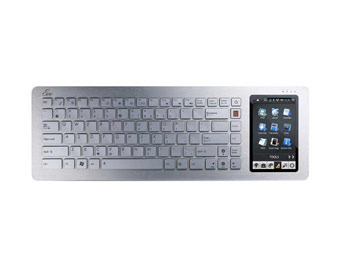 Asus positions Eee Keyboard as wireless control centre of multimedia technics. Depending on a complete set the device will be equipped with wireless modules Wi-Fi 802.11n and Bluetooth, ports USB and Ethernet, and also wireless module HDMI. Company Asus has not divulged cost Eee keyboard. One year ago it was informed, that the device will be on sale at the price from $400-600US.